The Visitors’ Centre at the London Temple is in rural England. It is a ten-minute drive from the closest railway station. There are no bus routes that take you there. It is surrounded by 28 acres of beautiful trees, shrubs, and flowers. Next to the Visitors’ Centre is the London Temple, an iconic landmark. In April 2016, Martin and Jan Lock, Directors of the London Temple Visitors’ Centre, were looking for ideas to bring people into the centre. Remembering that this area is referred to as the garden of England, they wanted to encourage more people to visit the Centre and see the gardens and the temple for themselves. Elder Lock planned a six-month advertising campaign with a local publisher, offering free guided tours, free parking, free admission, and a free buffet lunch for groups with 10 or more people. 14 groups came in for tours in 2016. The groups included women’s institutes, horticultural societies, Boy Scouts, Girl Guides, Rotary clubs, and U3A groups, to name a just a few. Realizing that many groups formulate their plans a year in advance, Elder Lock advertised in December and January for tours in 2017. From April to October 2017, 68 groups scheduled tours, resulting in approximately 1700 people coming to the temple grounds with 1200 copies of the Book of Mormon being handed out. During the tour the scheduled group meets in front of the Christus statue in the Visitors’ Centre. One of the senior couples assigned to the Visitors’ Centre introduces the volunteers working there. The couple then explain that Mormons are Christians, that the name of the church is The Church of Jesus Christ of Latter-day Saints, and that members believe in the Bible and the Book of Mormon, which both testify of Jesus Christ. After this introduction, Nick Palmer, the head gardener, talks about the plants and the trees on site and answers questions. He and his staff plant about 7,000 plants each season. The group then goes outside where participants learn about the Prophet Joseph Smith and the early days of the Church in England. In 1856 there were 34,000 church members in Great Britain and 12,000 church members in the United States. Most of the British saints immigrated to the United States to build up and establish the Church. Their contribution to the growth and stability of the Church is beyond measure. The tour guide explains that the Church architect, knowing the history of the Church, decided to plant a replica of the Sacred Grove found in the United States. The tour stops at the reflection pond and see how the temple is reflected in those waters, much as our lives reflect the covenants we make. Tour members learn about the history of the temple and why Church members were so anxious to have their own temple here. The guide explains the relationship between family history and its connection to the sacred ordinance work performed in the temple. At the end of the garden tour, the group enters the foyer of the temple and meet President and Sister Otterson, the temple president and matron. They explain why people are dressed all in white and what happens in the temple. They answer every question. 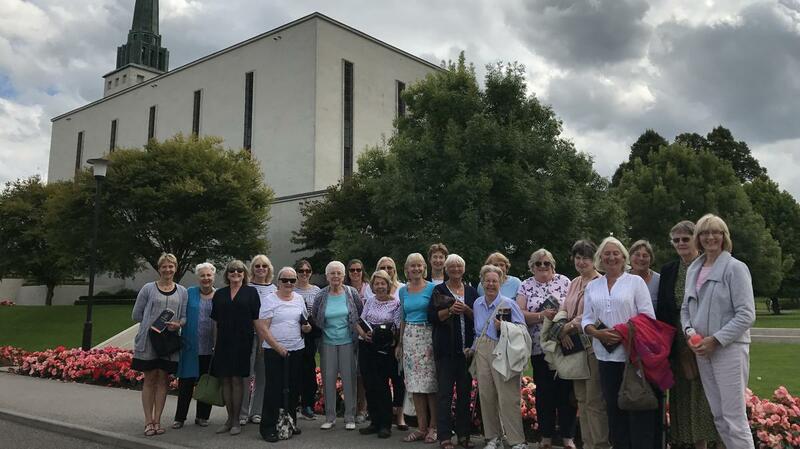 Tour members then return to the Visitors’ Centre for lunch followed by a short film, “God’s Plan,” in the theatre, which has touched many hearts. On their way out of the Visitors’ Centre, the tour guide gives them a Book of Mormon.